800 meters from the centre of Pythagorion Kouros Bay Hotel is situated on the beach. The hotel has a swimming pool, internet access, bar and terrace. The 53 air conditioned rooms have balconies which over look the mountains of Samos and the Aegean sea. We have just returned from a fantastic fortnight in Samos. The hotel was excellent. We loved the laid back atmosphere. 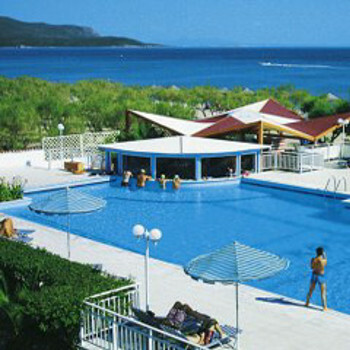 The hotel is not luxurious but very clean and in a perfect location away from the main road, and right on the beach. The rooms have air conditioning units but ours didn't keep the room very cold but it may be turned on more in the height of summer? The rooms were small once you added the spare bed but quite adequate. The beds were particularly comfortable and the bathrooms although small with just a shower were spotlessly clean. The beds were changed regularly although there was the stange habit of leaving the new top sheet folded on top of the bed! DIY bed making is not my strong point on holiday! There is a good sized swimming pool with a poolside bar which was just being refurbished. It was ideal as even if there were no sunbeds by the pool you could go onto the beach and it was only 2.50 Euros for a sunbed and no charge for the umbrella. The beach was also lined with small pine trees and you can walk along the beach nearly into the town of Pythagorio. The beach is a mix of sand and pebbles and we found the rubber diving shoes we had taken really useful as getting into the sea was painless! There are watersports available on the beach with rings, a banana boat, pedaloes & kayaks. There was no entertainment at the end of May but this was not a problem as the hotel taverna was open for meals/drinks if you didn't want to venture into Pythagorion. If you did want activities then you could just walk into the Doryssa Beach Hotel a 2 minute walk along the beach. We did their water aerobic class and a Greek Quiz one night. The hotel taverna is open all day and evening. It was a bit more expensive than restaurants in the town so we didn't use it in the evening but was useful on the first night. The buffet breakfast was excellent, again provided in the restaurant overlooking the beach. The hotel is at the end of the airport runway but you can only just hear the planes landing. However, when they take off its great to watch! Not a problem at all as their are no night flights just a bit of added entertainment. We can wholeheartedly recommend Samos, Pythagorio and this hotel.